It took me half of the first song to totally fall in love with this album. I'd never heard of Christy Nockels before this album but it is certainly a name I will be listening out for in the future. The album opens with No Not One and, I have to admit it concerns me. The opening bars are the chorus melody being played by a country-tinged violin which I worry listeners won't get past to get to the great pop/rock song which is a real hit. Read More It took me half of the first song to totally fall in love with this album. 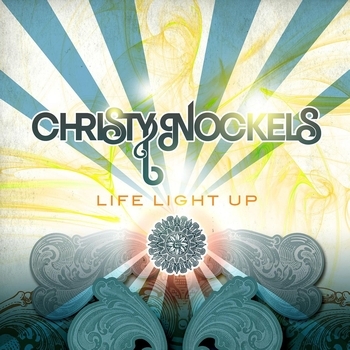 I'd never heard of Christy Nockels before this album but it is certainly a name I will be listening out for in the future. Nockels voice is not only beautifully strong but also emotional and filled with passion. Mix this with the deep, praise-full worship lyrics and the fantastic musical arrangement and you have all the ingredients needed for a killer album. The first single and title track, Life Light Up, is available on iTunes now and sums the album up perfectly. Starting slow with passionate lyrics it explodes into a melodic statement of faith and the desire to grow in it. The album then takes a few songs to slow down but it manages to continue without losing momentum in it and the lyrics carry through the entire album some of the most poignant prayers I have every heard. Lyrically, 'Choose' is an awesome proclamation of giving life over to God and the consciousness of that choice. It is backed up with beautiful harmonies, a great piano and acoustic guitar feeling back ups. Think of a slightly more upbeat Sarah MacLachlan song and you pretty much have the feel of this song nailed. The album closes with By Our Love, a mellow solo vocal and piano number which you would fit into most Sunday services. I guess you could say it is a modern day version of They'll Know We Are Christian's By Our Love (recently recorded by Jars of Clay on Redemption Songs), with it's message that it is the love for others and our treatment of them that should set us apart. I honestly don't think I could praise this album enough because I do believe it is one of the strongest albums I have heard in a long time and hopefully won't be the last we hear from Christy Nockels.